One should be honest to realize their mistakes, and learn from them. Mistakes are nothing but lessons. Everyone evolves by making mistakes and actually learning from them. We all make mistakes and we have the power to give ourselves a second Chance. Making mistakes is very common. In life, all of us make mistakes some time or the other. Making mistakes is human. What is important is to take lesson from each mistake that you commit and move on in life as a better, more evolved and seasoned person. Making mistakes is healthy and is a part of your learning curve. Always remember, that you are a work in progress. Mistakes are lessons learnt from life. Take the lessons learnt in your stride and move forward in your life, with renewed zest and vigor. Don't get stuck on all the havoc or loss that you suffered from the mistakes that you committed. Make yourself understand that everything happens for a reason. Making mistakes will happen at every stage in life. You are bound to make mistakes whether you are a child, a teenager or an adult. 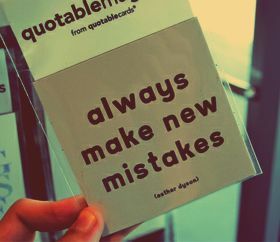 So, make mistakes and keep learning.